Civil society organizations (or nonprofit organizations) are playing a growing role in the field of welfare in Israel. In 2016, 43,000 nonprofit organizations were registered, a particularly high share of organizations per capita. Of them, 15% were active in the field of welfare. However, to date, there has been a lack of data on the scope of these organizations’ activities and funding. 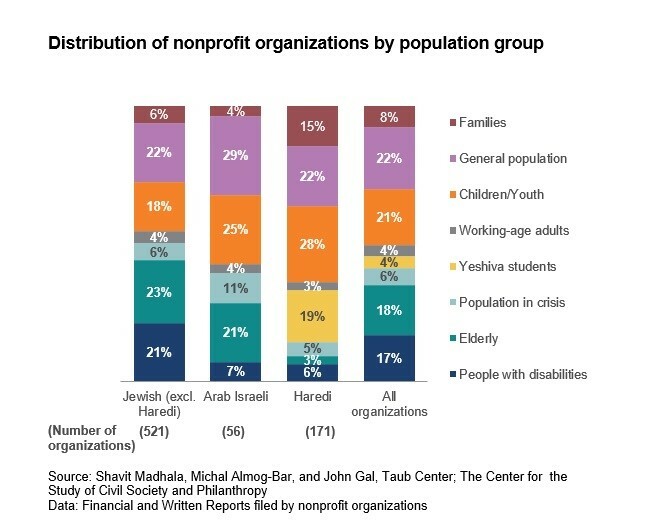 A new Taub Center study, conducted in cooperation with the Center for the Study of Civil Society and Philanthropy at the Hebrew University, maps out the welfare nonprofits in Israel. 7% have services designated for the Arab Israeli population, while 23% are intended for the Haredi sector. About one-fifth of the organizations serve the general population, about one-fifth are intended for children and youth, and the remainder focus on target populations such as people with disabilities and the elderly. About one-fifth of all organizations are new (have been operating for under 15 years) and, among the organizations focusing on the Arab Israeli and Haredi populations, the share of new organizations is relatively large. About 20% of the nonprofits are national organizations operating in five or more locations throughout Israel. About 20% of Arab Israeli organizations operate nationally, compared with 13% of Haredi organizations. The total revenue of the welfare nonprofit organizations examined in the study amounts to NIS 13.8 billion a year. 23% of that sum goes to organizations working with children and youth, 22% to those focused on the elderly, and 21% to those addressing the general population. The main sources of revenue are the provision of services (39%) and public funding sources (34%). Additional funds come from donations and bequests (25%). Among Arab Israeli organizations, the majority of funding is public (57%) whereas, among the Haredi organizations, funding from donations is prominent (38%). 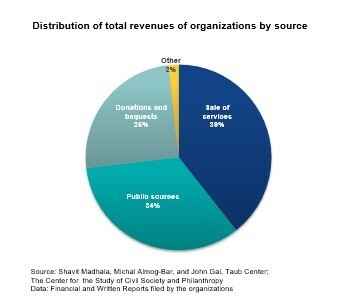 Most of the revenue of more longstanding organizations (operating for more than 15 years) comes from the provision of services and public funding while, among newer organizations, most revenue comes from donations. 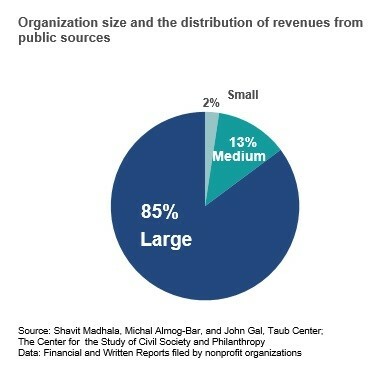 The vast majority of government funding (85%) goes to large organizations with an annual revenue of over NIS 10 million. Similarly, about half of philanthropic donations go to organizations whose revenues are in the top decile of the income distribution (the top 10%). Only about 2% of donations go to Arab Israeli organizations, while the share of donations received by Haredi organizations is relatively high – 30%. Personnel in the examined organizations stand at 370,000, of which 66% (243,000) are volunteers. Most of the volunteers can be found in nonprofits that focus on families (31%) and working-age adults (17%). A particularly high percentage of paid staff can be found in organizations that care for the elderly (33%). About 87% of the organizations’ personnel are concentrated in the large organizations, and it seems that among small organizations, the proportion of volunteers is higher. Only 1% of total personnel are either employed or volunteer in Arab Israeli organizations, compared to 11% in Haredi organizations.